Of the 124 species of wild coffee known to science, 75 species, or 60 percent, are threatened with extinction due to deforestation, climate change and the spread of diseases and pests, a new study has found. The wild relative of Arabica, the most widely traded coffee in the world, is in particular trouble. Around 72 percent of the wild coffee species occur within some protected area, but many of the parks also have lax enforcement, and coffee species are rarely included within park management plans. Coverage of the potential range of the species is also poor. Moreover, only half of all wild coffee species occur in germplasm collections — critical resources for producing more resilient varieties of coffee in the future. If you’re a coffee lover, you’re probably familiar with the two most widely grown coffee species: Arabica (Coffea arabica) and robusta (Coffea canephora). But there are more than 100 species of wild coffee lurking in forests scattered across Africa, Asia, Australasia and islands like Madagascar. Most of these wild species, including the wild relatives of Arabica, are at risk of extinction from deforestation, climate change and the spread of diseases and pests, a new study has found. The loss of these wild species could have serious consequences for the global coffee industry, researchers say. Davis’s tryst with wild coffee started more than two decades ago when he first went to Madagascar as part of a three-year project to study wild coffee species. There, he was surprised not only by the diversity of wild coffee species that the island had to offer but also by how poorly the species were known. Many of the species were also rare and difficult to find. “Since 1997 myself and Malagasy colleague Dr Franck Rakotonasolo have named 19 new species of coffee from Madagascar, including some of the most bizarre species in the coffee genus,” Davis said. Today, 124 species of wild coffee are known to science. And now, for the first time, we know their risk of extinction. By assessing thousands of data points collected by Kew scientists and collaborators over the past two decades, Davis and his colleagues found that 75 coffee species, or 60 percent, were threatened, according to criteria set by the International Union for Conservation of Nature (IUCN) Red List of Threatened Species. These include 13 species that are critically endangered, 40 that are endangered, and 22 species that qualify as vulnerable, the researchers report in the study published Jan. 16 in Science Advances. The wild relative of Arabica, the most widely traded coffee in the world, is in particular trouble. 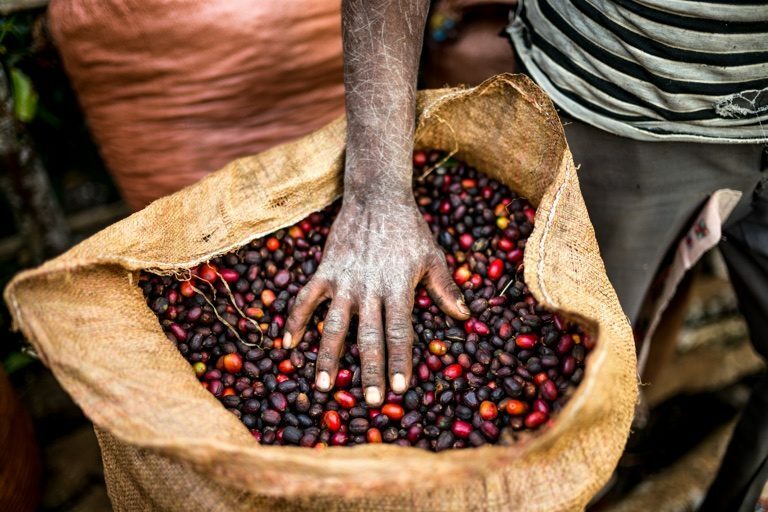 In a second study in Global Change Biology also published on Jan. 16, Davis and his colleagues showed that changing climate could drastically reduce wild Arabica populations in Ethiopia and South Sudan, earning it endangered status on the IUCN Red List. Freshly harvested Arabica coffee, Ethiopia. Image by Alan Schaller/Union Hand-Roasted Coffee. Of the 124 species, 14 were data-deficient. Nine of these species have not been seen since 1940, and some of them could even be extinct, the researchers say. About 72 percent of the wild coffee species occur within some protected area. While the number may seem high, the actual coverage of all of the forests that are potentially occupied by the species is a concern, researchers say. For example, only 4 percent of the potential forest area in which wild Arabica occurs lies within the protected areas of Ethiopia and South Sudan. Many of the parks also have lax enforcement, and coffee species are rarely included in park management plans. The preservation of wild coffee species in repositories of genetic resources called germplasm collections is also poor, with only half of all species represented to some degree. These “banks” contain seeds or tissues of plants and represent the genetic diversity of all varieties of coffee — critical resources for producing more disease- or drought-resilient coffee in the future. The article, originally appeared on Mongabay, is republished under CC BY-ND 4.0 license.